Be careful, this site is not for everyone and should only be used with mature students. 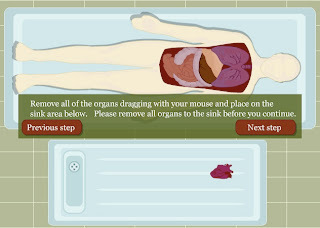 Interactive Autopsy is a step-by-step demonstration of what happens during an autopsy procedure. In the first step, the student will do the external examination to then move to the internal examination. Then the student will look at the internal organs by removing them. Then it is time for removing the brain and weighing all the organs. Then to finish the autopsy, it is time to return the organs to the body and sewing it up. All the steps are done interactively by dragging and clicking with the mouse. This site is easy to understand and great for students with interest in forensic science or who are big fans of CSI. What a great blog. Thank you for all of your great ideas. I also have a blog if you are interested! April 25, 2010 at 1:22 p.m.
April 9, 2011 at 12:02 p.m.
November 1, 2011 at 11:04 p.m.